Liu Bei (161-223) was the founder of the Chinese Shu Han dynasty and its first emperor. He went into battle against the Yellow Scarves rebellion in 184, along with his sworn brothers Guan Yu and Zhang Fei. Later (in 190) he joined Gongsun Zan against the evil Dong Zhuo who had seized the Han emperor Xian. After Dong lost, the emperor was in the clutches of his followers—until Cao Cao saved him and seized control over him. Cao Cao tried to conquer all of China for the emperor but in fact wanted to conquer it for himself. He defeated Liu Bei once at the Battle of Changban in 207 but was not able to win the Battle of Red Cliffs against the united forces of Liu Bei and Sun Quan, a warlord in the South. Sun Quan granted Liu Bei some land in the West of his domain, and the two agreed to fight Cao Cao again if necessary. From 211 to 214, Liu Bei conquered the country Ba Shu in the West. Because he had now an empire of his own, Sun Quan demanded his western regions back but Liu Bei declined. This made Sun Quan quite angry. After several useless battles against Liu Bei's general Guan Yu, Cao Cao chose to make a union with Sun Quan. They attacked Guan Yu with their allied forces and overthrew him in 219. Liu Bei was mad and swore revenge for the death of his brother and the loss of an important part of his empire. When Cao Cao died in 220, his son Cao Pi forced Emperor Xian of Han to give up his power. Cao Pi declared himself Emperor of the Wei Dynasty. Liu Bei found that offensive, for he was a member of the royal family of Han and considered himself the righteous Emperor of China. That's why he declared himself emperor of the Shu Han in 221. 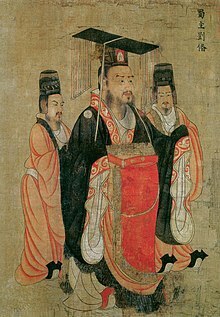 The next year, Sun Quan claimed the title Emperor of Wu for himself. Liu Bei was really mad at Sun Quan's arrogance. In 222 he opposed him in the Battle of Yiling but failed due to Lu Xun's (a Wu general) great tactics. After his defeat Liu Bei got ill and died a year later. His son Liu Shan followed him as emperor. Wikimedia Commons has media related to Liu Bei. This page was last changed on 4 May 2016, at 09:36.